Standout Riverstone Fireplaces . . . Cozy Cabin Hearths! The riverstone fireplaces depicted here are great for getaway cabins and weekend retreats. Featuring a wide range of stone sizes, configurations and colors, they embody the ideal of a cozy stone hearth! flects quality craftsmanship and pride of ownership. The next two fireplaces simply exude nostalgic charm. Note how the stones in the example by Luderowski Architects, pictured below left, diminish in size as they rise above the large rocks positioned atop the raised hearth. The charming designs that follow incorporate wood mantel shelves and other elements made of wood to add warmth and contrast. Note the large log corbels or "brackets" supporting the mantel shelf pictured below, left, by Custom Log Homes. The design on the right with an arched firebox opening is by Log Cabin Homes. Similarly, the designs that follow effectively make use of wood for added warmth and contrast. The camera lens of the talented Roger Wade Studio captured the beautiful design pictured below left. Below, right, is a striking corner fireplace design that combines riverstone with fieldstone. Another riverstone surround with large log corbels, the design pictured below is by PrecisionCraft Log Homes. consin Log Homes that features a half log mantel shelf. 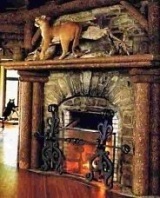 Below, right, is a riverstone and fieldstone fireplace design by Timberpeg. And finally, the cozy, comforting riverstone fireplaces that follow are by Golden Eagle Log Homes . . . . .
sign -- effectively tying it all together! Please check back often or subscribe to our RSS feed, as we fre- quently add new designs for river rock hearths to our site.